I love to cook, but I’m not much of a baker. I don’t do a lot with dough or yeast – but lately I have been delving into making my own pizza crusts. 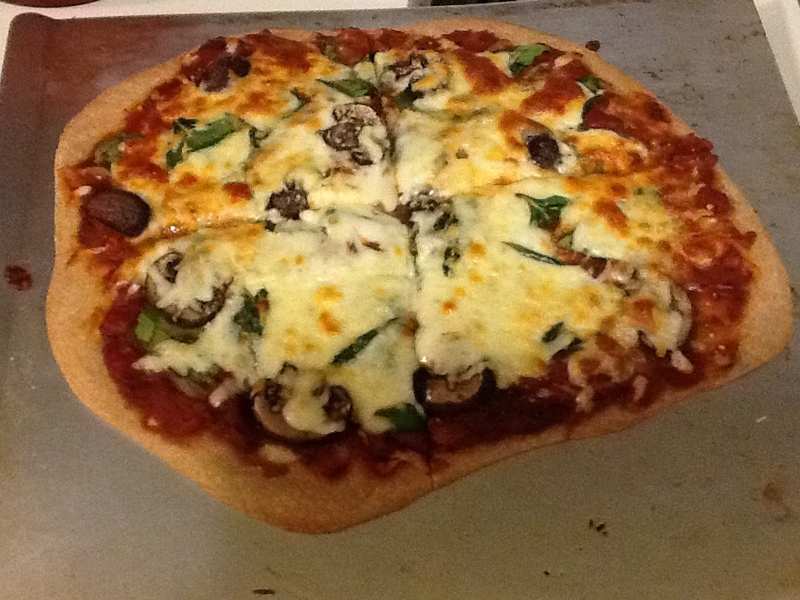 Last week I tried a new pizza crust recipe – and had JUST the right amount of flour, not even enough left over to dust the cutting board for the kneading process. This was somewhat problematic, as the kneading was quite difficult without it. …unless you make it into a mindful cooking exercise! With kneading you can definitely get into a zone much like meditation. Any repetitive movement can become a meditation, so kneading is no different. You can also coordinate the movement with the breath. You can slooooooow down, and you can repeat a word that you want to put into the food (I was repeating “love, love love, love…:). You can massage the dough rather than just flopping it around. 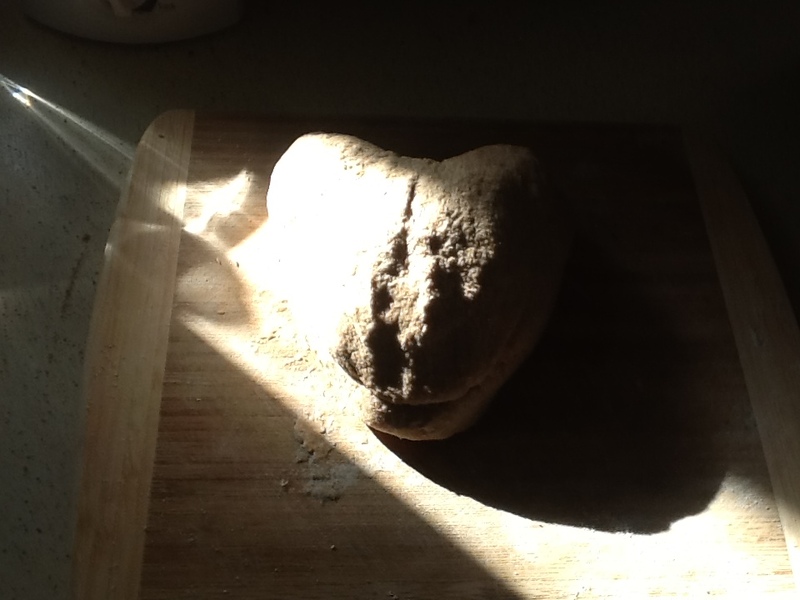 Through this simple act of kneading dough, you can cultivate joy! 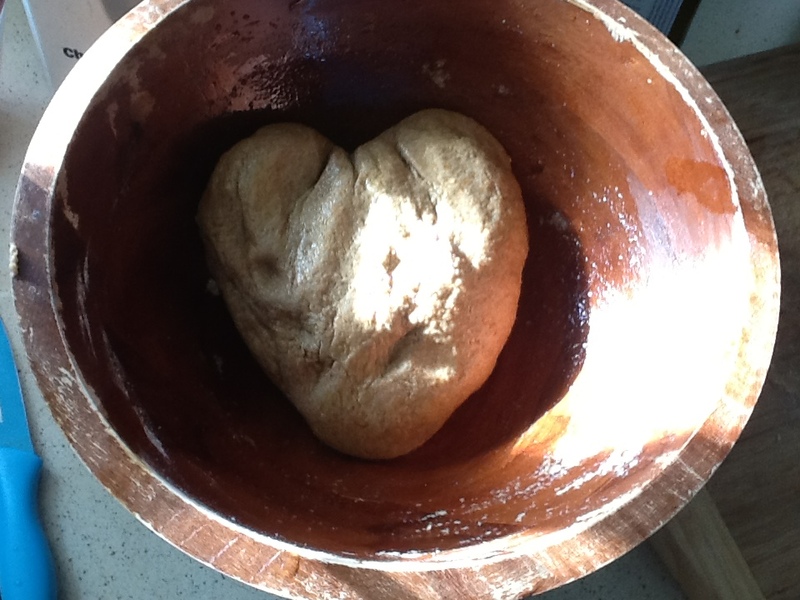 Before I knew it, 10 minutes had passed – and though I longed to continue my mindful needing, I wanted to follow the directions and I guessed that it’s possible to knead (need? ;) something too much. Good things come to those who wait! Rise, roll, add sauce, veggies, and cheese…then, the finished product! I think this is at least part of what makes a meal a PeaceMeal – add love, add loved ones (human or non-human), and enjoy. When you cook this weekend, try to make it a mindful cooking exercise. Put a little love in, and let us know how it goes! This entry was posted in Inner Peace, Mindful Eating, Mindfulness by stephanieknoxsteiner. Bookmark the permalink. You hit on something interesting here. Kneading is also a pun or a play on words. Did you also contemplate or investigate what it is that you are “needing” as you mindfully kneaded the dough?